It has been quite awhile since our last update and for that we apologize! We're hoping this patch makes up for it, releasing October 18th! We're very excited to give you a big sweep of balance changes, gameplay additions to objective points, a new Overtime rule, and of course... our very first Vanity crate feature everyone's favorite upcoming holiday, HALLOWEEN! Check all the details below and post in the comments if you have any questions! All three objectives now have a second tier available to complete after the first tier is taken. There is a 60 second timer after the Tier 1 objective is completed, allowing you and/or your team members time to strategize on how you want to complete the next objective. Once an objective is taken, any current progress on that objective is wiped clean. The damage dealt by Mire is now governed by a spell on the affected units rather than by splash damage. This means it now operates similar to Repair Bubble and follows normal spell stacking rules, so it won’t stack with itself when cast from multiple sources. As a consequence of the new setup, % based ability damage bonuses will now work with Quantum Mire. Halloween has come to Europa! 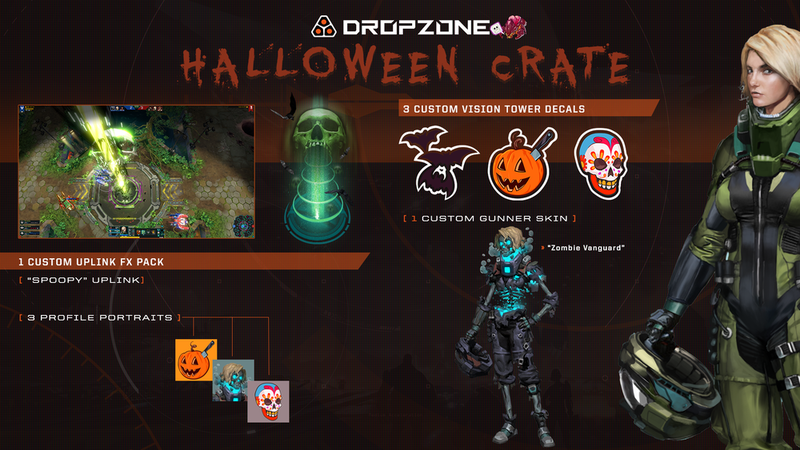 To help celebrate the event we have added our very first vanity crate to the crate Shop and every single player that logs in for the month of October will get ONE FREE Halloween vanity crate! Just visit the shop and claim it! Important note: It is impossible to get duplicates with Vanity crates! So the good news is once you purchase the crate and receive your item, the next time you purchase the crate you’re guaranteed to get a different item from the crate! Rename Tokens are finally here! Dropship avatar packages have been sent to all our Dropship retweeters!